Hello girls! I'm back N ready to bite! 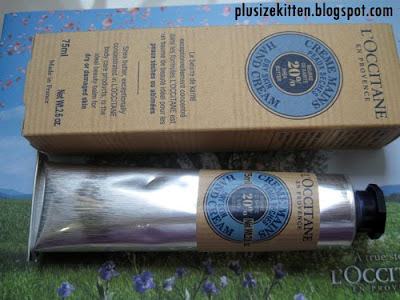 My latest beauty hauled is from L'occitane. 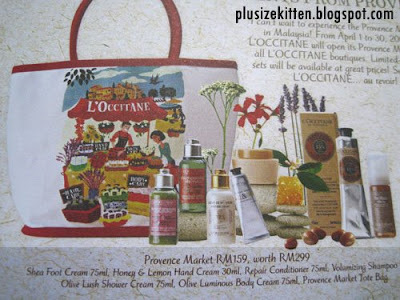 I saw their promotional booklet from The Malaysian Women's Weekly Magazine and the promotion is on their Provence Market range whereby they have sets of products with tote bag/pouch at a promotional price. 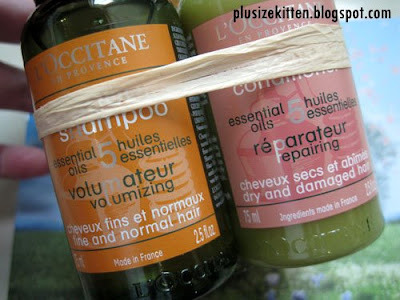 This promotion is from 1st -30th April, 09 only at all L'occitane boutiques! You don't need the booklet to buy it, just walk in and you are able to select & purchase! 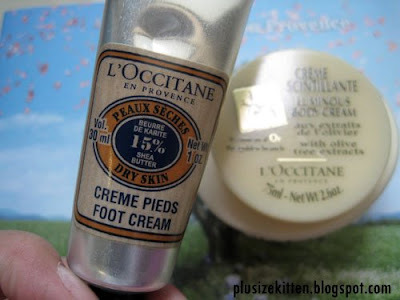 Shea Foot Cream 75ml, Honey & Lemon Hand Cream 30ml, Repair Conditioner 75ml, Volumizing Shampoo 75ml, Olive lush Shower cream 75ml, Olive Luminous Body Cream 75ml & Provence Market Tote Bag. 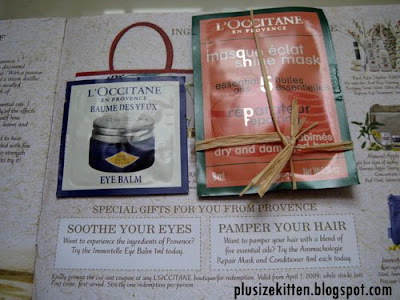 Soothe your Eyes & Pamper Your Hair Freebies! 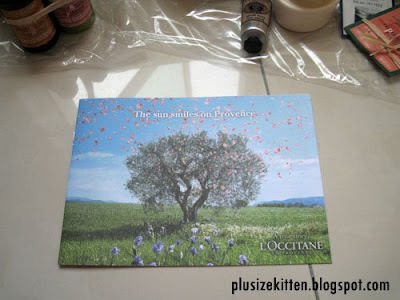 Not to forget, the juiciest of them all is the freebies from the booklet. 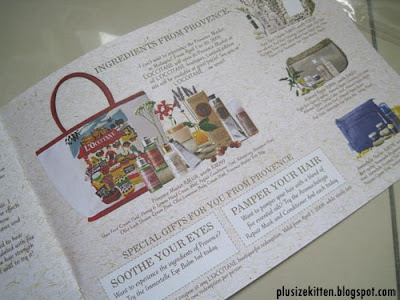 You can get 3 samples from 2 coupons available on the last page of the booklet. 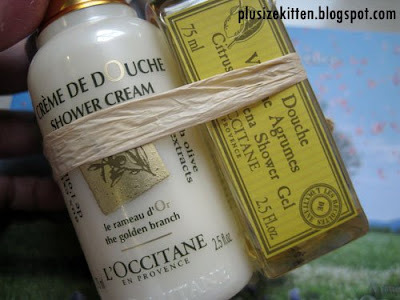 Cut them out n bring to L'occitane boutiques for redemption. Valid from April 1st, 2009 while stocks last. First come first serve! Strictly one redemption per person. Want to experience the ingredients of Provence? Try the Immortelle Eye Balm 1ml. 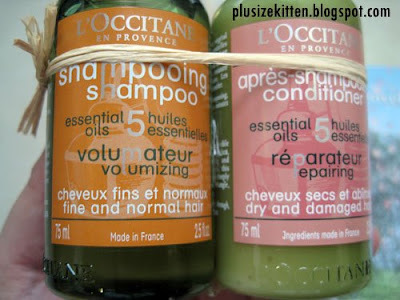 Want to pamper your hair with a blend of 5 essential oils? Try the Aromachologie Repair Mask and Conditioner 8ml each today. Here's my hauled! I got 2 sets of the RM159. I found out that it's not strictly one set alone. You can choose from like 3-4 set types with mainly the foot and hand cream being different range and maybe a shower gel or two. There's also a face care set + body combo too, but I already have enough face care products so I'm going to try their hair n body care range. 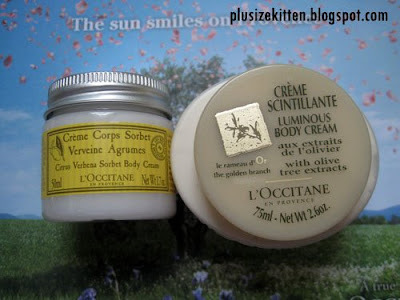 I'll start by showing you the Cherry Blossom Hand Cream Combo (I only called it that because it has a cherry blossom hand cream in it, to differentiate the combos). This is the advertised combo. Note that all combos has 7 items in it. It could be a mixture of products but you'll definitely have the shampoo and hair repair item in it, some shower gels, hand & foot cream which could be in other range like cherry blossom. 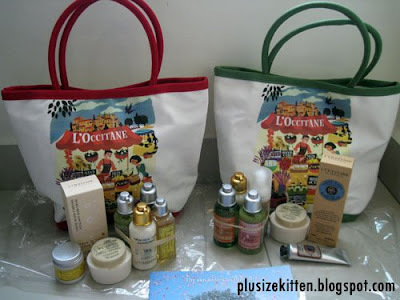 Others sets are like the Red Rice Starter set RM99 (worth rm151) or Almond Apple RM99 (worth rm231). 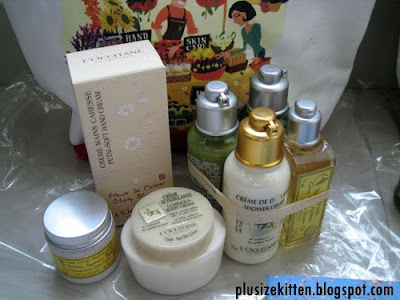 Immortelle Starter goes for RM119 (worth rm220). You can get the booklet and check it out. I bought these for Mother's Day gift which is next month! so you're not losing out if you're going to pamper your mom with some serious luxury sets that comes with a Tote Bag. Imagine 7 items for RM159? it's like RM20++ each. 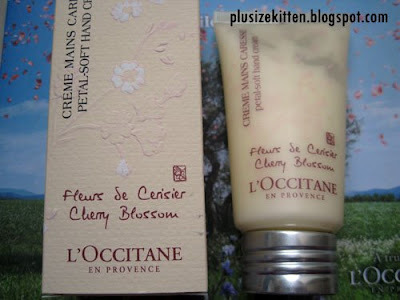 Hoohoo, read this L'Occitane Cherry Blossom han cream almost run out, this promo just come in time!!!! only avaible boutique?counter have this promotion or not? wahhhh so tempted to buy. I gona b so broke. I jst bought 2 hair brushes from Acca Kappa today. Cost me 280rm! I wonder wats in the immortelle starter pack. I heard is damn good products range for anti aging for our mom. 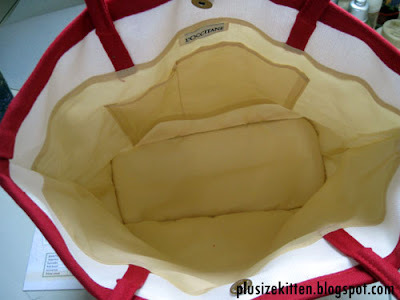 Check my blog entry on Acca Kappa. Ooohhh.....Miu, U really know how to tempt people la! 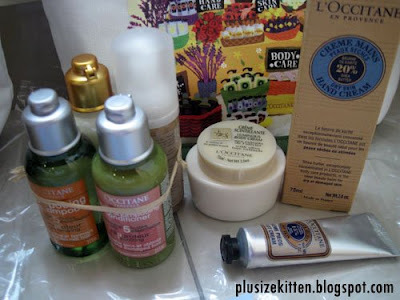 I dropped by KLCC L'Occitane just now after Stila. Got the freebies!!! Yay to freebieholics like us!! MW: yah like the bag too! Joey: yes i like the cherry blossom range too! that's one i choose the combo with it. 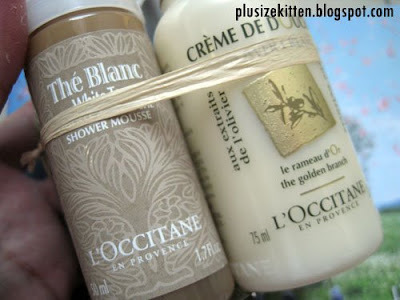 squirrelicious: wah.. the hair brush i read from ur blog pricey oh! seriously thinkin about it.. but i save money first. now pokai liao.. the immortelle set i not sure what's in, i threw my booklet away liao. If i find it back i update in blog.